Schools are back and the Scottish Friendly Children’s Book Tour is revving up the book bus and getting ready to head out for our first tour of the Autumn Term. We are thrilled to be taking best-selling author Christopher William Hill, author of the deliciously gruesome Tales from Schwartzgarten series, to primary schools in Moray, Aberdeenshire and Aberdeen. To celebrate Christopher’s upcoming tour we are giving away a signed and dedicated copy of the first book in the series Osbert the Avenger! In which fictional town is Osbert the Avenger set? The closing date for entries is Thursday 17 September. To enter please add your answer as a comment below along with your name and email. View full terms and conditions here. Christopher William Hill is the author of the fantastically macabre Tales from Schwartzgarten series. Set in the gothic city of Schwartzgarten, these dark tales are hilarious and unsettling in equal measure. The villains are vicious, the settings are sinister and good does not always prevail. . .
Over the course of a jam-packed week Christopher will meet over 1600 pupils from 12 different schools in Moray, Aberdeenshire and Aberdeen. The sessions will be full of sinister stories, gruesome games and perhaps even some ghastly surprises – pupils and teachers beware! Keep up to date with ghastly tales, photos and videos from the road with our Twitter and Instagram. As a child Christopher had his own museum! (Actually a large walk-in wardrobe where he stored his collection of ancient relics). Christopher loves ocean liners, airships, Victoriana and cake shops! 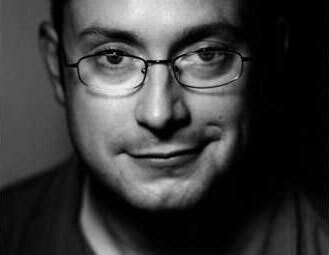 As well as writing children’s fiction, Christopher is also a radio dramatist and playwright. Christopher is an ardent Enid Blyton fan and as a boy read The Famous Five over and over again – not because of the adventures but because of the food! 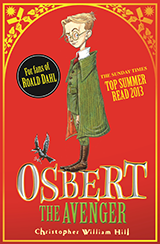 Osbert the Avenger is the first book in the deliciously dark Tales from Schwartzgarten series. Osbert Brinkhoff is a precociously clever 11 year old who is sent to the The Institute, Schwartzgaren’s most infamous school. The tutors at The Institute are ghastly, set on crushing the soul of every pupil they teach. One by one Osbert deals out justice to his malevolent teachers, plotting their demise in increasingly outlandish and grisly ways. If you prefer cleavers to kittens and fiends to fairies then welcome to the gruesomely gothic Tales from Schwartzgarten.